For a few years in the early 1990s, during my exile in New Jersey, I worked a genuine 9-5 job. 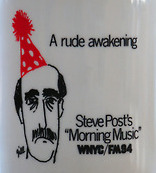 WNYC was my lifeline, and Chopin’s Marzurka in C Major (Op. 24 No. 2) was my signal that I absolutely had to get out of bed and into the shower in order to get to work on time. † “Mayor” means “higher” in Spanish. This entry was posted in Music and tagged nyc, obituary, radio. Bookmark the permalink.